Unfortunately I can't report that Freestone went as good as Hangtown. My qualifying times were good. I felt comfortable on the track and with the heat. Things just didn't play out as I had hoped when it was race time. First moto I crashed on the first lap at the end of the whoop/roller section. I cross rutted and shot off the track. Somehow I saved it but I hit a flagger when I tried to swerve back onto the track. :[ After the crash, I got up a few places from last. By the end of moto one I had worked my way up to 12th. My second moto played out very similarly. I got tangled in a tight corner with a bunch of girls and looped out trying to escape the mayhem on the first lap. That left me dead last. The rough track made for a fun time coming through the pack haha. I wound up 12th once again in the end. 12, 12 on the day gave me 12th overall. Thankfully I wasn't seriously hurt in my crashes. I earned points each moto and am sitting 6th in points. I'm not proud of the race but I've learned from it and I'm excited for the rest of the series. I have plenty of time to redeem that weekend and I suppose it's better to get the bad race out of the way sooner than later. We have a few weeks break before our next round which is nice. We'll have some time to get my motor and suspension done. It's also a great time for us to get some solid training in and improve our weaknesses from the first two rounds. Tune into WMX Round 3 at Thunder Valley in Lakewood, CO on June 25th! Thanks so much to my family for supporting me and getting me to the race. My mechanic, Gus Walker, is always awesome and inspiring! As well as a huge thanks to all my sponsors; Fox, WSMX, WarhawkMX.com, Mana Strength and Conditioning, The Dirt Lab, Strong Cryogenics, Rekluse, Snap Fitness, FMF, Utopia, D&K Service, Enjoy Graphics, and Adam’s Chiropractic. 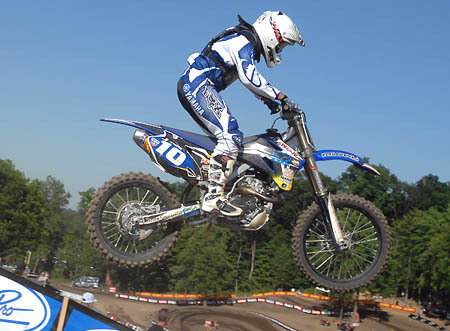 Follow Jacqueline Strong through the WMX 2011 race season.